This website brings to you—what Wheelchair Cushion Sage considers to be—the best wheelchair seat cushions, chairs, and associated accessories available anywhere in the world today. If you know of a demonstrably superior product that is helpful to wheelers, tell us about it. 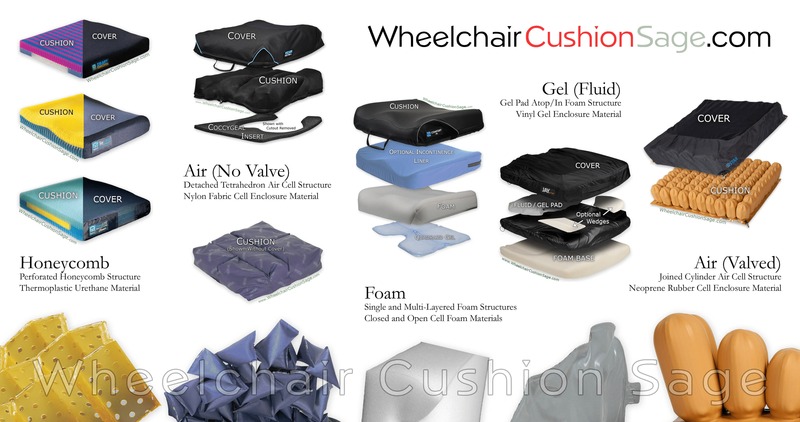 Regarding cushions, there are many different types of wheelchair cushion structures (the red text links to a large image). Which one do you buy? A thoughtful approach to the buying decision will consider the individual user's physical condition, together with cushion-specific factors such as: pressure distribution, air circulation, heat transfer, moisture retention, stabilization, maintenance, durability, weight, and cost. It is impossible to accurately identify the best wheelchair cushion for a particular individual without first establishing a mutually understood prioritization of the relevant factors, together with an accepted means of assessing each factor's efficacy. The best seating solution for a physically active, minimally impaired wheelchair user who desires the lightest weight cushion possible is one matter. However, a different cushion will likely best serve someone whose condition severely limits their physical movement and whose highest priority entails the absolute optimal pressure relief for their particular pelvic physique. Thus, selecting the best cushion for a particular individual should consider a number of case-specific factors and is best determined on an individual basis. You are welcome to call Wheelchair Cushion Sage during business hours to discuss your particular situation.